On the final day of Event #30: $1,500 Pot-Limit Omaha, Ryan Bambrick started out in the lead with 13 players remaining. He lost the lead to Sampo Ryynanen early on, but took it back right around the time it started to matter. In the final stage, he dominated the play to eventually walk away with $217,123 and the gold bracelet. "I was just trying to play my best game the whole time," Bambrick said right after posing for the winner photos. "I was really focused on trying to win. I wasn't really concerned about the pay jumps. I just wanted to win a bracelet, to be honest with you." Bambrick, who's been playing online poker for over 15 years, has been a day trader for the last seven years. But poker has always been something he did, the last couple of years on the side. Last January, he found a new site and has been crushing there ever since. He cashed out his bankroll, told his boss he would be back after the summer, and went out to Vegas for six weeks of tournaments. "I told my work I just wanted to play poker for now, and wanted to see how the World Series would go. I might pick it back up after the World Series," Bambrick said about his job as a day trader. "I'm not sure what I'm gonna do." With play getting underway at noon, 12 seats were occupied. Just chipleader Bambrick was missing; he got in about half an hour later. And not just that, he had been an hour late on Day 2 of the event as well. "It's a long walk to the room and I like to sleep in sometimes. I had a hard time falling asleep last night; I finally fell a sleep at like 5 or 6 in the morning and slept in. I got here half an hour late but whatever," Bambrick said with a big grin on his face. When Bambrick sat down, players like Victor Ramdin (aces cracked) and Lexy Gavin had already departed. Within the first level, the tournament was down to a final table of ten, and the official final table of nine was formed not much later when defending champ George Xu exited in 10th place. Pushpinder Singh was the first player from the official final table to bust. He got it in with top pair and top kicker but ran into Ryynanen who had the same top pair and top kicker but had a flush draw and backdoor Broadway draw to go along with it. Ryynanen made runner-runner straight and Singh said his goodbyes. Several players were short stacked by the time they had made it to the final table. Randy White was one of them and departed soon after Singh. He got it in with jacks versus kings and was drawing dead by the time the turn hit the felt as his opponent flopped top set. Not even 15 minutes later, White was joined on the rail by Danny Woolard. His pair was no good anymore after the turn as his opponent turned two pair and rivered a full house. Sampo Ryynanen, the lone European, took control of the table at this point. The rest of the table couldn't do much against his raises and three-bets and Jody Fayant became just one of his many victims. Fayant, severely short, found a real hand with single-suited queens and fours but ran into the kings of Ryynanen. No queen, four, or other help for Fayant, and that was it for the Canadian; out in sixth place. Four minutes later, Jared Ingles hit the rail. His single-suited jack-ten with eights was no match to McDermott's double-suited ace-king-seven-six. Sampo Ryynanen pulled away from the field, but it wouldn't last. Phil Riley fell first, losing rainbow aces with queen-deuce to jack-ten-nine-eight as McDermott turned trip nines. After that, start-of-day chipleader Ryan Bambrick doubled through Ryyanen in a massive hand that saw him hit a set of sixes on the turn while his opponent had a pair, flush draw, and open-ended. The river bricked and Bambrick took over the lead in the match. "That was a big hand — the crucial hand. 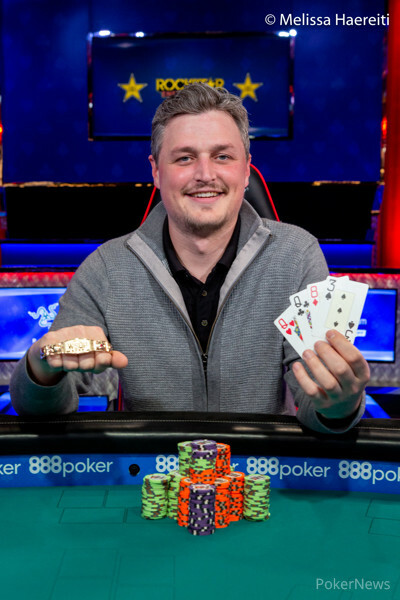 It was a beautiful card for me on the turn and a nice river for sure," Bambrick said afterward about the hand that helped him regain the lead. Tim McDermott was the shortest and lost the remainder of his chips in a small pot to Bambrick where the latter had flopped trips. McDermott was out and could dream about the Mirage again. He just missed out on the heads-up battle. Bambrick started the heads-up with a sizable lead over Ryynanen and would extend the gap in one of the first hands of heads-up play. He made a flush in a big pot and saw Ryyvanen. Bambrick grew his stack to 5.2 million with just 6 million in play. It was all Bambrick in the final stage of the tournament. He might have missed the first couple of hands of the day, and some hands getting back from dinner break a bit later than the rest, but it didn't hurt him one bit as he conquered the $1,500 Pot-Limit Omaha; taking down the event in dominating fashion. In the last hand of the tournament, he got it in with an overpair to Ryyvanen's middle pair. The dealer wasted no time dealing blanks on the turn and river and the two shook hands as it was all over. "I had played with [Ryyvanen] a lot on Day 2 so I got to know his style pretty well, which definitely helped. He played really well. He was a really tough opponent, but the cards went my way," Bambrick said afterward. Bambrick enjoyed playing in the spotlight with the people at home able to watch his every move. "It was a lot of fun, that's the best way I can describe it. I enjoyed every bit of it. It wasn't too daunting. It was exciting more than anything. I had a lot of people watching the stream. My phone was blowing up the whole time." 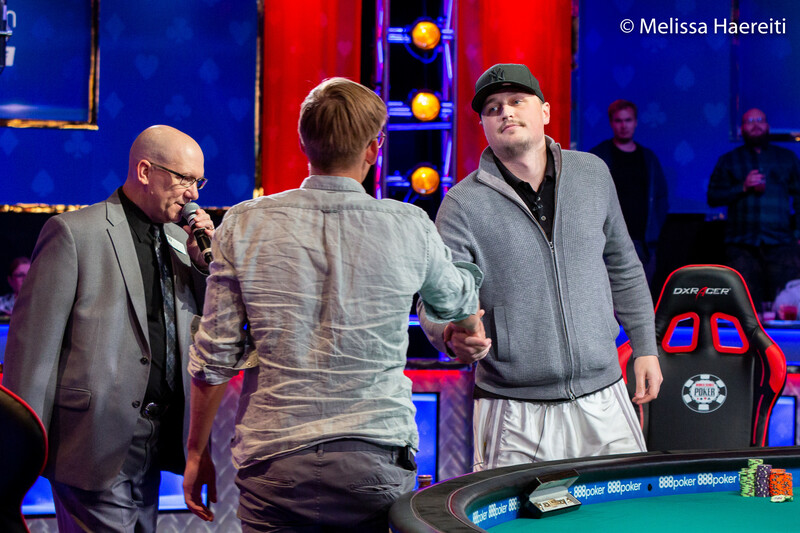 Ryan Bambrick raised to 240,000 from the button and Sampo Ryynanen called from the big blind. The flop came and Ryynanen shoved for 300,000. Bambrick called to put him at risk and the two players tabled their hands. Bambrick had the lead with his queens and Ryynanen needed help from the deck to survive. 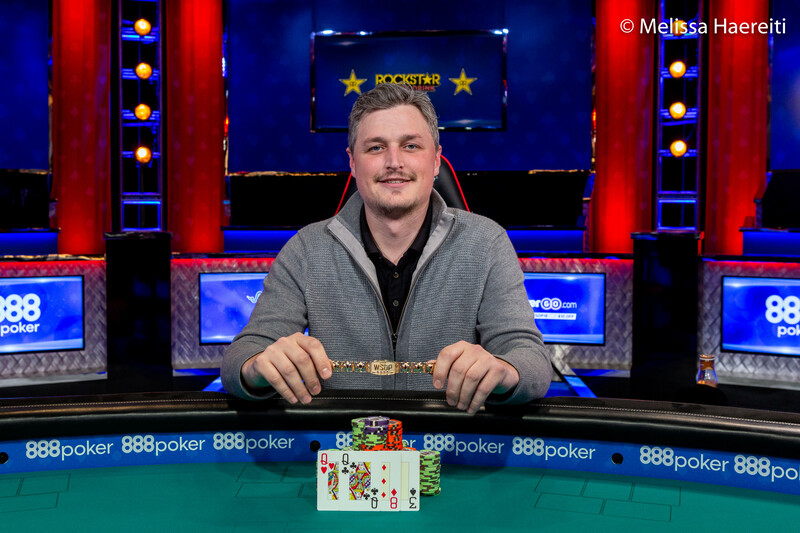 The turn and river were no help to Ryynanen, so Bambrick took the pot to stack him and end the tournament. 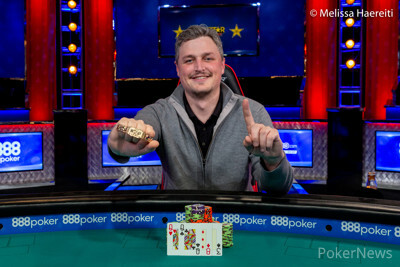 Ryan Bambrick raised to 180,000 from the button and Sampo Ryynanen called from the big blind. The flop came and Ryynanen checked. Bambrick bet 200,000 and Ryynanen called. The fell on the river and Ryynanen checked. Bambrick bet 650,000, sending Ryynanen into the tank. He ultimately called and Bambrick rolled over . Ryynanen mucked and Bambrick took the pot with his baby flush. Tim McDermott raised to 210,000 from the button and Ryan Bambrick called in the big blind. The flop came and Bambrick checked. McDermott jammed for 370,000 and Bambrick quickly called to put him at risk. McDermott found himself trailing Bambrick's flopped nut boat and needed a lot of help from the deck to survive. 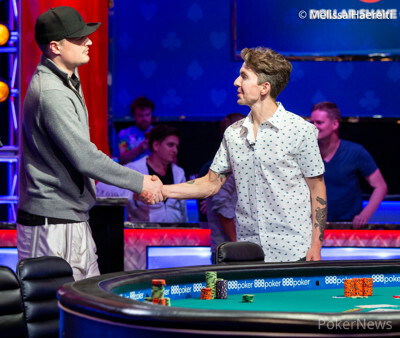 The turn and river changed nothing, so Bambrick took the pot to end McDermott's deep run in this event. Sampo Ryynanen in the small blind raised to 180,000. Big blind Ryan Bambrick three-bet to 540,000 and Ryynanen called to create a 1.08 million pot. The flop came and Ryynanen checked. Bambrick shoved for 325,000 effectively and Ryynanen called instantly. With most of the money in before the flop, the first three community cards had something big in store for both. But while Bambrick would usually have at least outs with top set, this time not so much as Ryynanen tabled the flopped straight flush. The on the turn was inconsequential and so was the on the river. That was good for a double-up for the former chipleader. Ryan Bambrick and Sampo Ryynanen saw a flop of and they both checked. The turn brought the and Ryynanen bet 200,000. Bambrick called. The hit the river and Ryynanen checked. Bambrick bet 600,000, Ryynanen folded, and Bambrick took the pot. Tim McDermott raised to 150,000 from the button and Ryan Bambrick called from the big blind. The flop came and Bambrick checked. McDermott bet 80,000 and Bambrick check-raised to 350,000. McDermott tossed his hand into the muck and Bambrick took the pot.